which I’d wanted to see because it plays a central role in his book. And people are eager for those skills and that knowledge. It seems that Unlearn/Rewild has appeared at just the right cultural moment. Humans, clearly, are realizing they desperately need to reconnect with nature. We live in a time when educators and psychologists hold conferences on “nature deficit disorder,” when people consider it life-changing to complete the David Suzuki Foundation’s 30×30 Nature Challenge (spend 30 minutes outside per day for a month); when urban gardening is taking over backyards and rooftops. The Globe and Mail just last month identified “rewilding” as a cultural movement. With a business motto that says “You bring ‘em! We squeeze ‘em!” I wasn’t quite sure what to expect when greeted at the farm gate by Boycie, a Border Collie cross, and Dexter, a rambunctious and friendly Husky/Shepherd cross. Amidst a flurry of wagging tails and a canine happy dance, Rae Brett quickly approaches with a big smile and opens the gate to welcome me to Scrumpy’s Apple Press and Cider House in Merville. I was immediately impressed with the orderliness of this five-acre property with its beautiful 2,200-square foot single-story home, outbuildings, orchard, vineyard, greenhouse and gardens, but what was top of mind for me was to discover what, exactly, does ‘Scrumpy’ stand for? A scruffy, grumpy grandpa perhaps? It was one of the last glorious days of summer when I sat down with Rae and Frank Brett (and the dogs) to talk about how this once forested plot of land has recently been transformed into a productive hobby farm… and how it came to be named Scrumpy’s. Frank explains that, while he is a grandfather, he doesn’t think he is a scruffy or a grumpy one! ‘Scrumpy’ is, in fact, a term used to describe a potent apple cider from the West Country of England. The word is believed to be derived from the obsolete West Country dialect term ‘scrimp’, meaning a small or withered apple. This gave rise to the verb ‘scrump’, meaning to steal fruit. In a nutshell, ‘Scrumpy’s’ is simply a name chosen to reflect a little fun and whole a lot of history. Scrumpy’s Apple Press & Cider House is a brand new business opened by the Bretts, who are relative newcomers to Canada and the Comox Valley. They met 28 years ago while they were both living in Alberta. Frank was a mechanical engineer from London, England, working in the petroleum services industry. Rae was from Winnipeg and was working in a bank. In 1986, the couple moved to the south coast of England and commuted to London for work. It was while living in the UK that they both developed an interest in fruit and vegetable growing. When it came time to retire, after 21 years working in the UK, they wanted to return to Canada. They chose to live in the Comox Valley because they liked the climate and its rich agricultural history. In the seven years since, the Bretts have been tackling one project after another. In addition to planting 65 apple, pear and plum trees—many of them Heritage varieties—and a vineyard, they tend to nine nut trees, three massive veggie and fruit beds (with a fourth one in the works), rows of currants, thornless blackberries, Tay berries and other fruits, and a 30x 42-foot greenhouse. In the near future, adding an irrigation system, a run for meat birds and a small piggery on the back two acres are on the lengthy list of ‘Things to Do’. But it is not all work and no play—at least for the dogs! They enjoy daily games of fetch and swimming in the new pond. The 275-vine vineyard is, in itself, a testament to the countless hours of backbreaking effort that Rae and Frank have put in to carve a productive hobby farm out of what once was a forest. Like all vineyards, the rows are perfectly straight and widely spaced, and the juvenile grape vines are being coaxed along a wire trellis system. What’s different is the nearly 70-tonnes of Merville rock that has been moved by wheelbarrow and dogged determination to create a ‘heat sink’ around the base of the plants. The neatly piled rocks not only aid in weed control, they absorb heat from the sun and radiate that warmth to the roots of the plants when the temperature drops in the evening. It is a technique sometimes used in other parts of the world but likely unique here. While last year’s crop of grapes may have ended up as bird food, the Bretts had lots of other fruit to deal with. The fruit press and cider making equipment that now occupy two of the three bays of the home’s attached triple-car garage were purchased to make good use of the abundant fruit crop. With the orchard producing more apples in the future, the Bretts are hoping to eventually be able to sell Scrumpy’s hard cider from their premises but they still need to investigate the government rules and regulations—a process they are just starting. In the meantime, the ‘Cider House’ part of the business name will have to remain the North American version of apple cider (apple juice) rather than the alcoholic hard cider, or ‘Scrumpy.’ The ‘Apple Press’ part of the business, however, is up and running. “At first we were only thinking about getting equipment to process the apples, pears and grapes grown on our acreage and to make cider and juices for our own consumption,” says Frank. “After doing some research, we determined there was a market for an apple and pear pressing service, together with grape crushing and de-steming, focused on small to medium-sized individual orders. We can now process up to 4,000 pounds of fruit per day. If you have trees laden with fruit and think you would like to turn them into juice, the Bretts advise that the best time to pick apples and pears is when the fruit easily parts from the tree when lifted and turned slightly. It can have a few scabs or bruises but must be free from punctures, rot and molds and, ideally, should be harvested from the tree, not picked up off the ground. That said, windfall fruit may be okay to process, as long as it has only been on the ground for a day or two, is washed and is not rotting. A simple rule to consider: If you wouldn’t eat it, why would you want to drink it? When it comes to cleanliness, care and maintenance of the processing equipment, the Bretts employ strict cleanliness and sanitation rules. The room and equipment where the fruit is processed—in fact, the entire property—is immaculate. If there is any doubt about the cleanliness of your fruit, you can wash it prior to bringing it to Scrumpy’s for processing or they can do it for you. Some customers prefer not to wash the fruit, to preserve natural yeasts that aid in a natural fermentation process of ciders. If the fruit is rotten, Scrumpy’s cannot process it because it could contaminate the presses, passing on that contamination to other people’s juice. Scrumpy’s is different than other apple pressing services because they use a standard 1×1-foot milk crate to measure the fruit by volume, not weight. (They charge $4.25 per crate.) This volume is equal to about .7 of a bushel and will yield about seven litres of juice. Regardless of the load size, you can rest assured that all customers only receive juice from their own fruit. To transport your fruit to Scrumpy’s, any sturdy container will do—they have plenty of milk crates to load it into for measuring. But you do have to bring your own sealable, clean juice containers. Dairy containers (milk jugs) can be used, but only after proper customer sanitization, as there is a higher risk of spoilage and contamination with this type of vessel. Before the fruit can pressed it must be crushed or ground to break the skins. It then goes into the bladder presses and is subsequently collected into holding vats and measured in litres before being poured into the customers’ containers. Ideally, because the juice is not pasteurized, it must be refrigerated and should be consumed within a couple of weeks. It can also be frozen for later use or taken to a You-Brew facility to be made into cider or wine. You can pasteurize the juice at home by packaging it in sterilized containers and heating it to 160 degrees Fahrenheit for two minutes. The waste product created from the juice pressing is called pommace. Some customers like to take this home to feed to livestock or to compost. If you don’t want it, the Bretts add it to their own compost pile to ensure that everything goes back to the land. While not certified organic, they do not use pesticides. 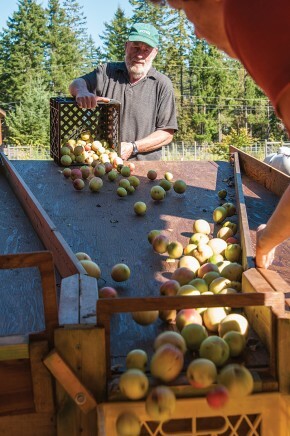 While the season is short for fruit pressing, the Bretts keep busy year round as they continue to develop the acreage and tend to their ever-expanding orchards and gardens. Rae has even taken some of this year’s harvest and created a line of ‘Scrumpy’s Scrumptious’ homemade preserves to sell and, next year, they plan to sell fruit and vegetables from their gardens and greenhouse. When the Pineapple Express winds and rain blow across the Island over the winter months, Rae retreats to her craft room to work on quilting and jewelry-making projects. Frank continues with reading and researching about the apple industry. He loves finding and reading old books written about heritage apple growing and farming practices. His free time will be spent working on their website and business planning, as well as making cider. This labor-intensive working ‘retirement’ is not for everyone but the Bretts are content to be creating their own piece of paradise in the Land of Plenty. It’s apple pressing season and Scrumpy’s Apple Press & Cider House is open for business Thursday through Monday, 7:30 – 9:30 am for fruit delivery and 2:30 – 4:30 pm for juice pick up, now through October 28. After that, they are open Sundays from November 3-17 (same hours). Learn more at: www.scrumpysapplepress.ca, call 250-337-8592 or visit them at 7590 Armstrong Road, Merville.